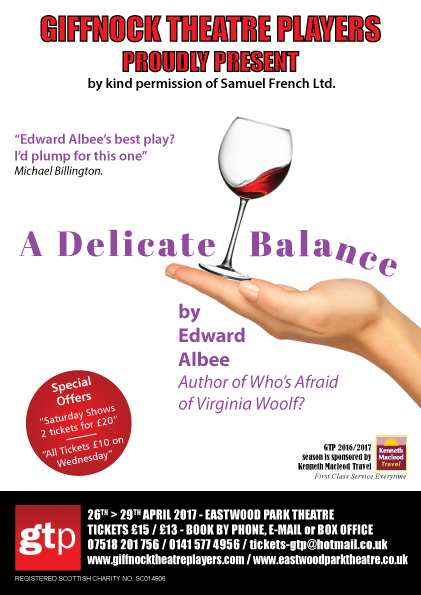 In tribute to Edward Albee’s life, work, and achievements who died in New York on September 16th 2016 at the age of 88, GTP proudly present A Delicate Balance. Funny, surprising, and remarkably meaningful. Tobias and Agnes are glamorous retiree WASPs inhabiting a world of cocktail parties and social clubs. But the return of their prodigal daughter fleeing her fourth failed marriage, the constant presence of Agnes’ alcoholic sister and the spontaneous late-night arrival of some neighbours filled with an unnamed terror, soon begin to strip away all the veneer and upset the delicate balance of their home life. Laced with coruscating wit, Edward Albee’s dark comedy won him the first of three Pulitzer Prizes and followed the success of the hugely successful Who’s Afraid of Virginia Woolf? “Edward Albee’s best play? I’d plump for this one.” Michael Billington. Performances – each evening at 7.30pm and Saturday Matinee at 2.30pm.